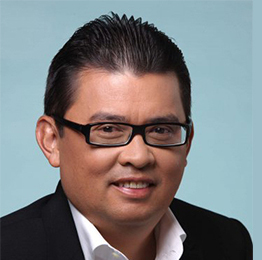 Joey is the President and CEO of RFM Corporation, a major food and beverage company in the Philippines. He previously held similar positions in the various subsidiaries of the company such as RFM Equities, RFM Insurance Brokers, Inc., Rizal Lighterage Corporation, Cabuyao Logistics & Industrial Center, Inc., Interbake Commissary Corporation, Filipinas Water Bottling Co., Inc., and Invest Asia Corporation. Known for his dynamism, high entrepreneurial skills and aggressive market-driving approach, Joey was able to take RFM Corporation to the next level after transforming the company from a once commodity-oriented business to one of the country’s leading branded consumer food and beverage corporations. He is also behind the growth of Swift meats, Selecta milk drink, Sunkist juice drinks and White King flour-based products. He is an Awardee of the Ten Outstanding Young Men of the Philippines (TOYM), 1995 and of the Time Global 100 List of Young Leaders for the New Millennium, 1994. He was also given the Anvil Award of Excellence for Advocacy by the Public Relations Society of the Philippines and the CEO Excel Award by the International Association of Business Communications. In 2011, he was hailed Forbes Asia as one of the 48 Heroes of Philanthropy. He was appointed as Presidential Consultant for Entrepreneurship in 2005. As a pro-bono Presidential Consultant, his mission is to help develop entrepreneurship and the “entrepreneurial mindset” among the Filipinos through a national advocacy movement called “Go Negosyo”. He was also appointed by President Rodrigo Duterte as pro-bono Presidential Adviser for Entrepreneurship last August 2016. He founded and established the Philippine Center for Entrepreneurship Foundation, Inc. (PCE) with the vision to improving entrepreneurship education nationwide. Joey holds a Bachelor of Science degree in Business Management from De La Salle University. Nic markets brands and causes, crafts communications strategies and amplifies messages. He put together a team of freelance consultants that collaborate whenever a project is undertaken. 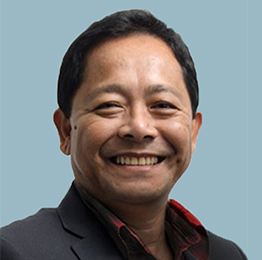 It specializes in communications strategy planning and executions, marketing and business development, media business management, research, and project feasibility studies.He just finished a successful stint as the lead person in executing the above the line (TV/Radio) strategy of the Duterte Presidential campaign, and also managing the campaign’s social media component. Over the past 40 years, he has worked with various industries and brands, with dealings at the top levels of management. He was the General Manager in The Nielsen Company (Feb 1987 – June 1989), Program Director for Pharmaceutical and Health Care Association of the Philippines (July 1989 – Dec 1989), VP of Research and Business Analysis in ABS-CBN Broadcasting Corp. (Jan 1990 – Feb 1997), Sr. VP for Integrated Sales & Marketing in ABS-CBN Broadcasting Corp. (Feb 1997 – Aug 2005), Marketing and Network Programming Consultant in INTV Marketing and Productions (Jan 2006 – June 2007), President in ZOO Mobile Marketing Solutions (Apr 2007 – Apr 2008), President & CEO of Omnicom Media Group (Jun 2012 – July 2015) Nic is a strong strategic thinker and team builder. He is a data driven executive but can make effective decisions even without the benefit of full information. His career spans across sales, marketing, business strategy, communications strategy and execution, research, and media management. He was also a member of the faculty in Ateneo de Davao University from June 1979 to March 1981 and in UP College of Health Sciences from November 1982 to June 1986. Nic graduated from Ateneo de Davao University with a degree in BS Management Engineering in 1979 and finished MS Industrial Economics from the University of Asia and the Pacific in 1983. Bea Teh-Tan was appointed Consumer Business Manager for Citi Philippines in March 2013. 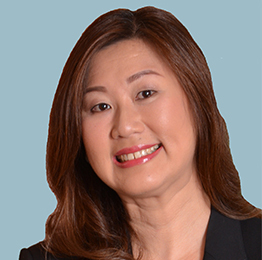 Prior to this role, Tan was Credit Payment Products Head managing the consumer finance portfolio, including credit cards and personal loans.She joined Citi in 1998 and has held a variety of roles including Strategic Planning Head as well as Head for Cards Marketing, Sales and Distribution. Bea has been instrumental in driving the growth of Citi’s consumer banking business by retaining its top market position in credit cards. Under her leadership, Citi launched the PayLite Installment platform which is now widely used by Asia Pacific countries offering installment facilities, as well as a number of other award-winning products. She forged key partnerships with other industry leaders and as a result, Citi has an enviable portfolio of credit card products as well as personal loans today.Bea was earlier recognized as one of the most promising young talent in the financial services industry by The Asian Banker. She was awarded in 2008 as one of the Top 100 Most Promising Young Bankers in Asia Pacific and Gulf Region. In 2014, Bea was recognized by Hotel Sofitel for her notable industry contributions and excellent fulfillment of her role as a mother, ‘Sofitel’s Remarkable Mothers Award.’ In 2015, Bea was also featured in Town & Country Philippines as one of the top 50 Most Influential Women in the country. In August 2016, she was recognized as one of the Most Influential Filipina Women in the World Award™ (Filipina Women’s Network Global100™) by the Global Filipina Women Network. She graduated from De La Salle University with a Bachelor’s degree in Commerce, majoring in Economics and Business Management.